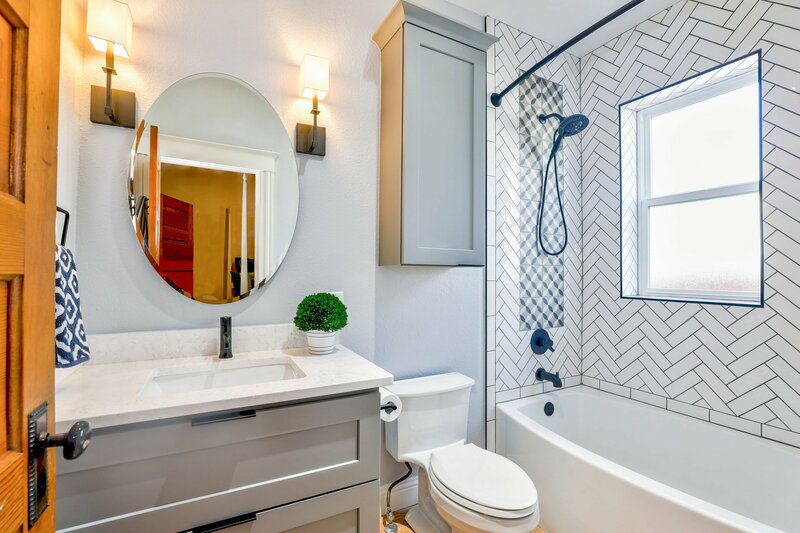 After a long winter, it’s nice to update your home with a splash of color to usher in spring. The easiest way to do this is to change out your throw pillows. 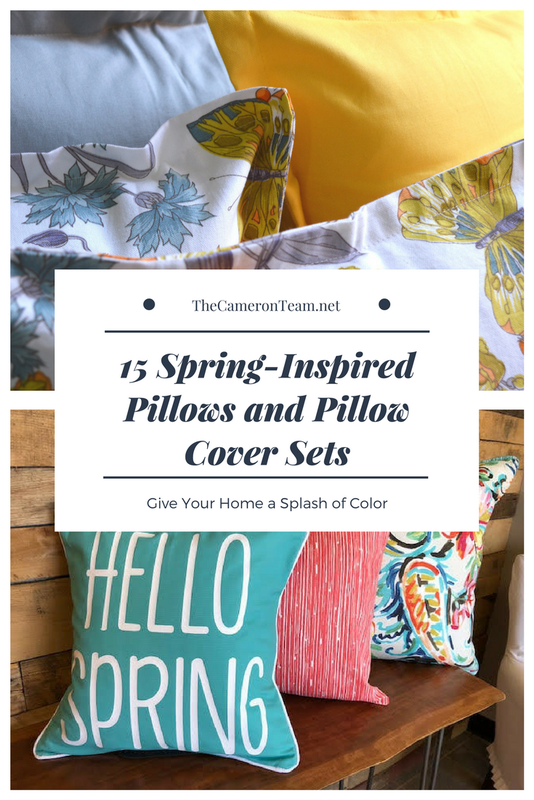 We’ve compiled a collection of spring-inspired throw pillow sets, both covers and full pillows. Designs include printed and hand-painted, shabby chic and vintage, whimsical and classic…there’s something for everyone! 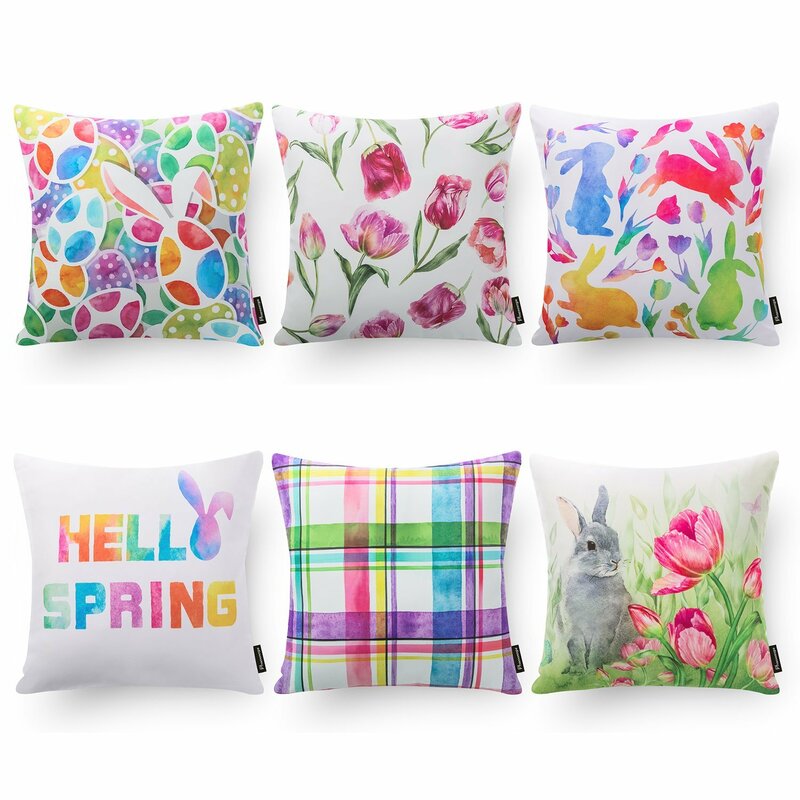 Of course, it’s hard not to acknowledge Easter when writing about spring, so there’s some Easter pillows included, as well. Take a look and let us know in the comments which ones are your favorites. Please note: The Cameron Team has not been paid or received any other compensation to include any of the products featured on this post, but the author has included affiliate links and content. If you click on a link, they may earn a commission with no added cost to you. It’s a high-five for great content! Spring colors are usually pastels, which you can see in the light blue in these cotton linen throw pillows from Sykting, but what really sets them apart is the bright yellow. It just screams sunshine, something we really need after the coldness of winter. They’re perfect for a sunroom or great room with lots of windows. 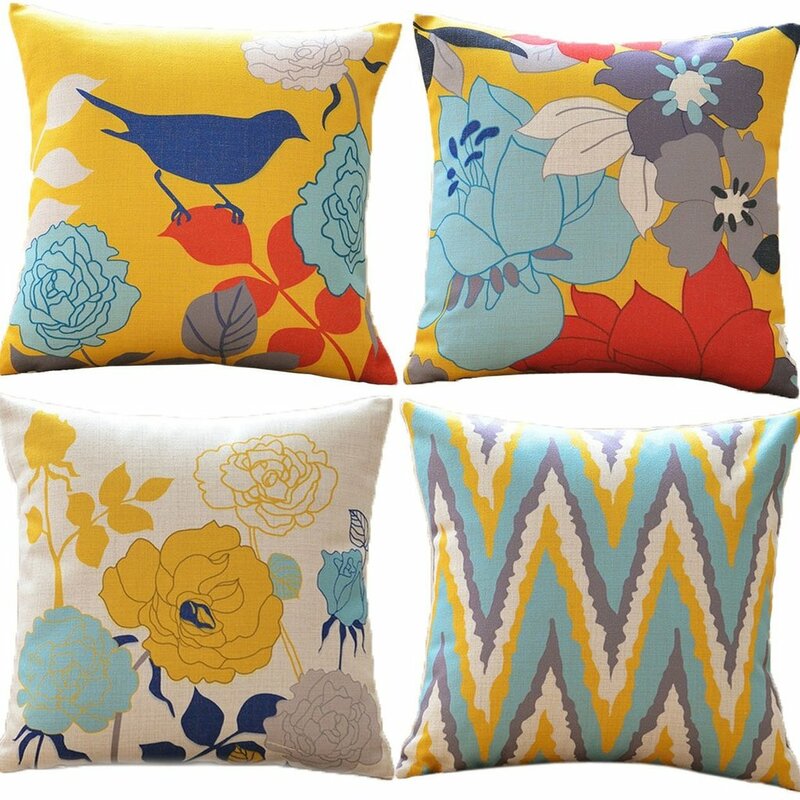 If you like the vintage look, you’ll love these pillow covers from Micropillow. The birds, posed beside flowers and fruit, look like they should be resting on a love seat in a parlor or formal sitting room. The light teal color is fitting for someone who may shy away from the bright yellow of the Sykting pillows shared above. 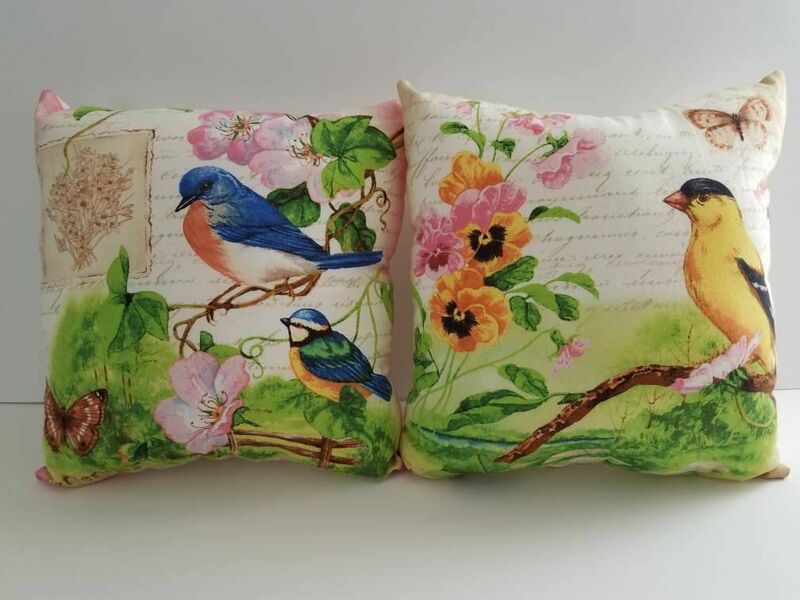 These beautiful bird pillows are bursting with color. Bluebirds and a goldfinch rest on branches beside flowers and a lovely green field. 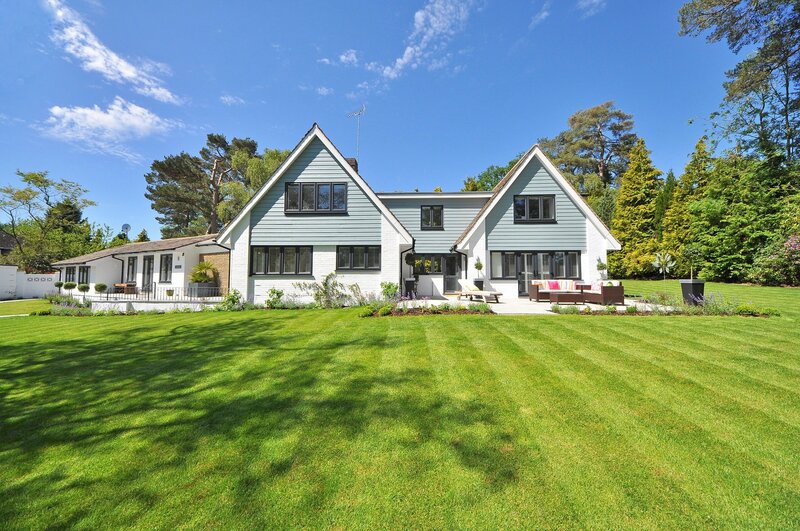 The design is both romantic and full of life, just as spring should be. 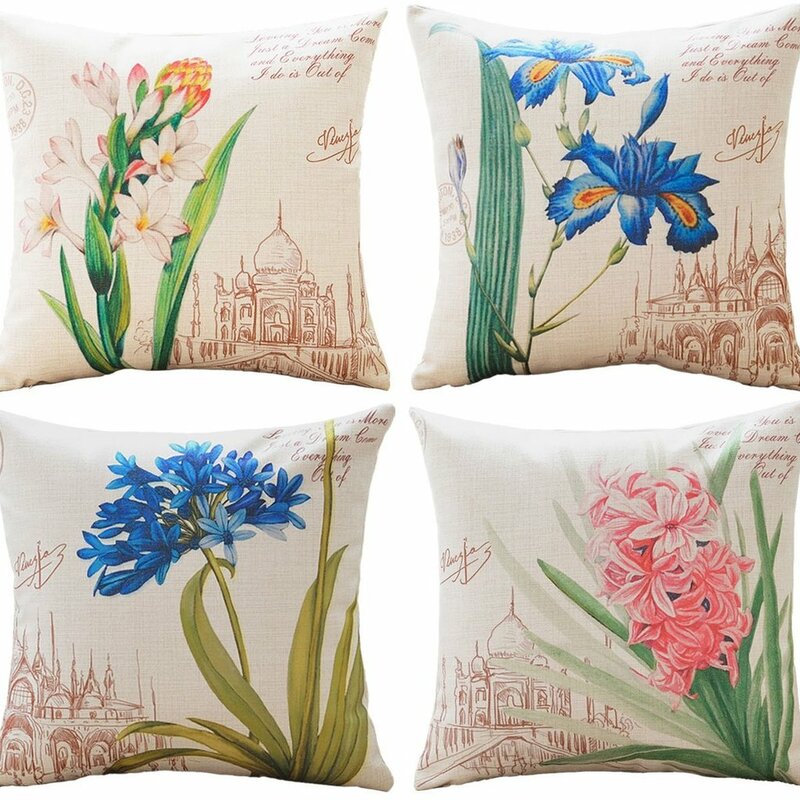 These cheerful spring pillows from Merry Pillows are covered in watercolor blossoms and leaves. Use them together on your couch or settee, or divide them around the room. They’ll add a moderate touch of color to your living room. 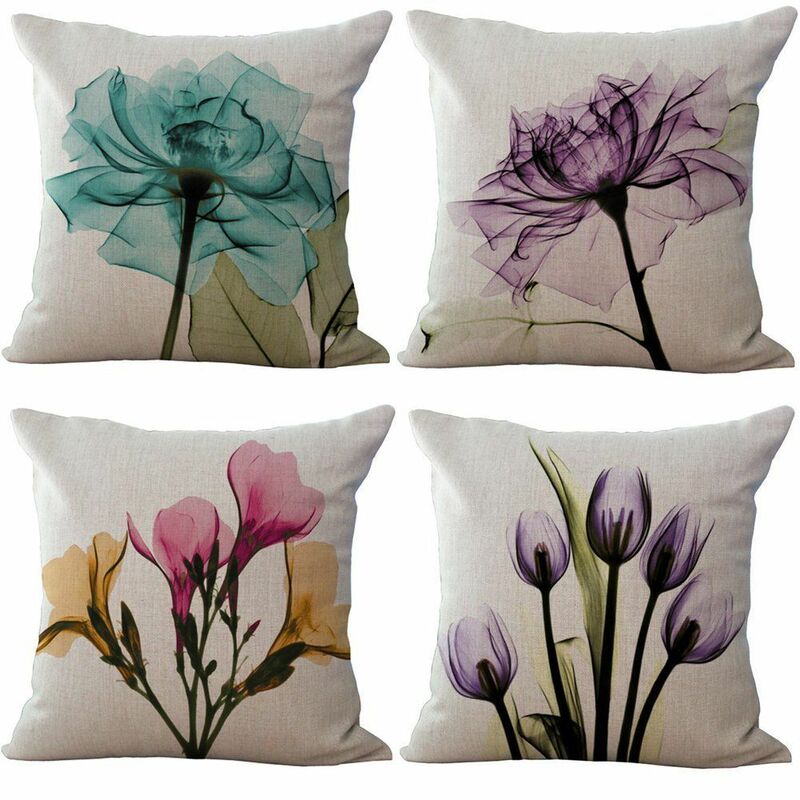 This unique flower pillow set is a fun spin on photographic prints. It’s X-ray flower art, which makes the flowers and leaves look see-thru. Paired with the taupe fabric, these pillows are classy, stylish, and perfect for a neutral living room or bedroom. These spring pillows are for worldly travelers…or those who wish they were and like to decorate with scenes from around the world. Lovely painted flowers rest upon a backdrop of sketched famous buildings and a partial quote about love. The colors are vibrant and would look lovely in a home office or sitting room. 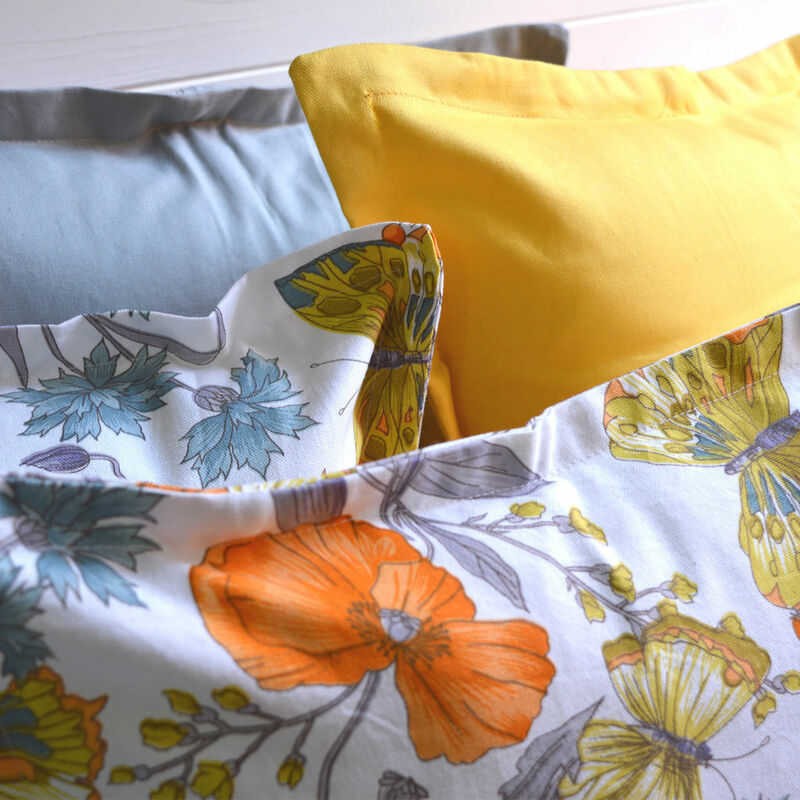 Here’s another spring pillow set for those unafraid to decorate with yellow. This set includes two solid color pillows and two print pillows. The print has yellow butterflies flitting around tiny yellow flowers and what appears to be red-orange poppies. Consider adding them to your bedroom or sunroom collection. 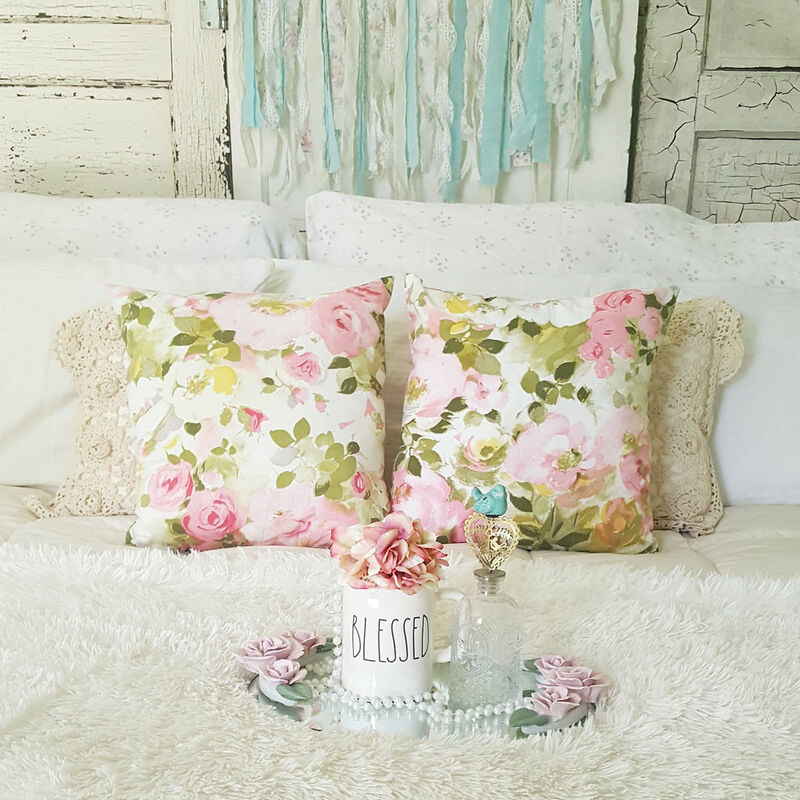 If your home is decorated in shabby chic or a cottage style, these lovely pink flower pillows are a wonderful way to jazz up your decor for spring. The feminine watercolor print goes well with vintage lace and neutral fabrics. They’d be a great addition to a bedroom or sitting room. 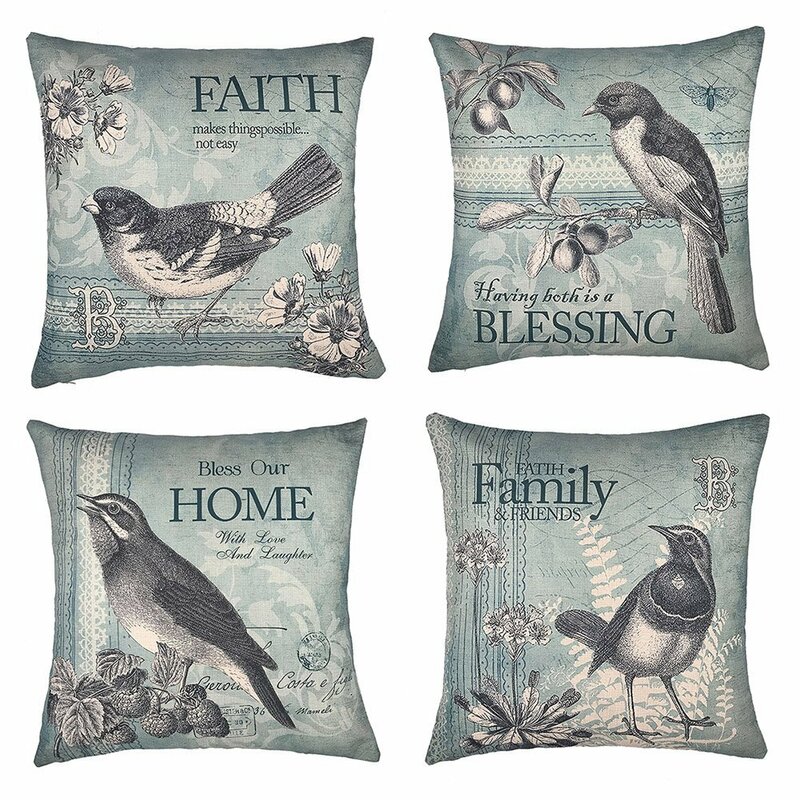 Typography has been a big trend in home decor and these pillow covers fit right in with it. 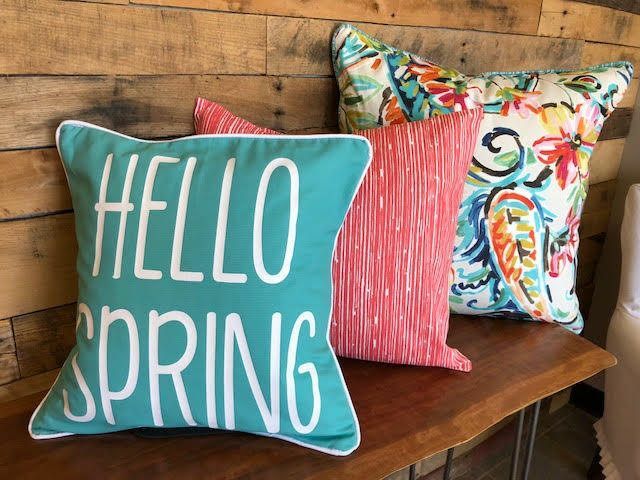 A bold turquoise pillow cover says “Hello Spring”. It’s design is paired well with a red corded pillow cover and another with a bright floral print that incorporates the colors of the first two pillows. The set definitely welcomes spring and would work well on a neutral colored or matching sofa. Okay, confession time! 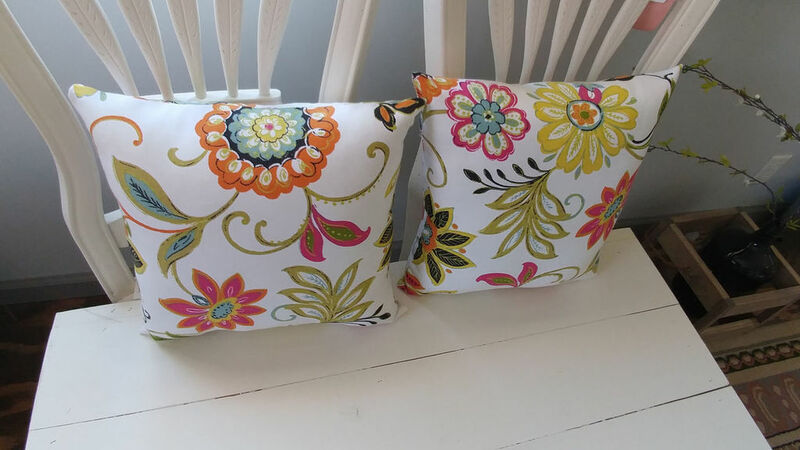 These are more like accent pillows than throw pillows, but they were just too darling to leave out. 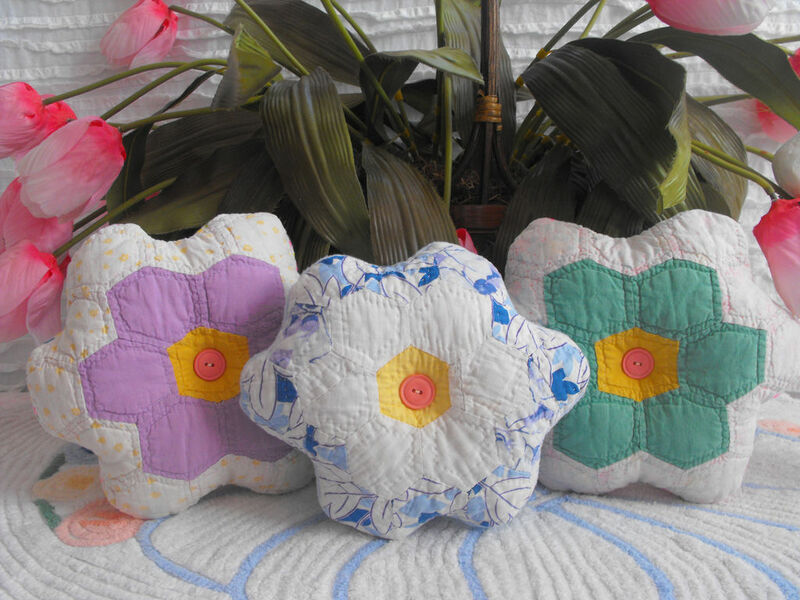 Made from vintage quilt pieces, these Grandmother Flower quilted pillows are full of character. While you could place them on a couch or bed, they would also be great in a medium-large basket beside a fireplace hearth or a table in a foyer. Want a bright pop of color with a tropical flair? 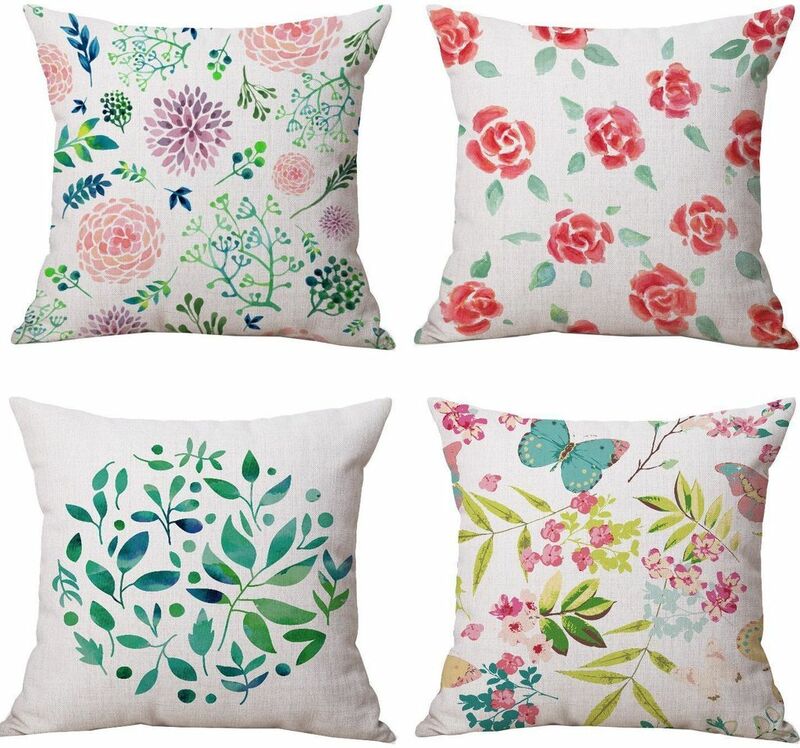 These floral pillows are perfect. 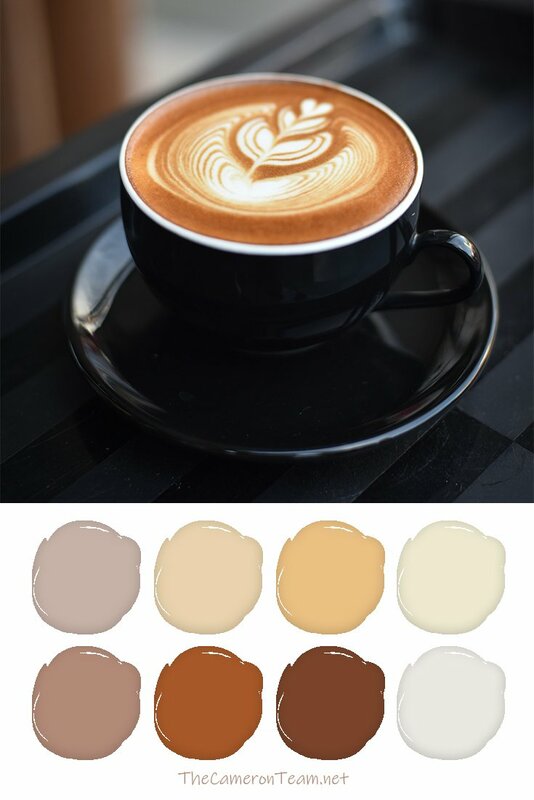 They go well with vintage and milk painted furniture, and would also look darling on a window seat. As mentioned above, it’s hard not to talk about Easter decor when addressing spring. 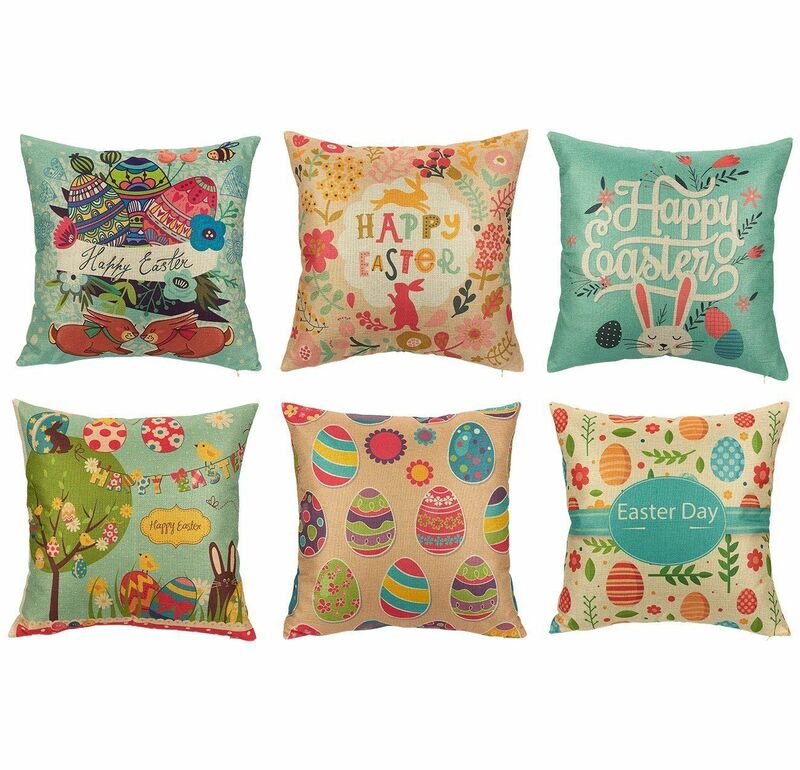 This colorful, whimsical Easter pillow cover set looks vintage-inspired. Eggs, bunnies, chicks, and flowers are presented in full force. Definitely a fun set, especially if you have kids or grandkids. These bold Easter pillow covers are so much fun! There are 6 total in a variety of designs. Place them all out at once or switch out the obvious Easter prints for those that are generally more spring. They’re sure to brighten up a living room, sunroom, bedroom, etc. We love understated design and this bunny pillow cover set is just that. 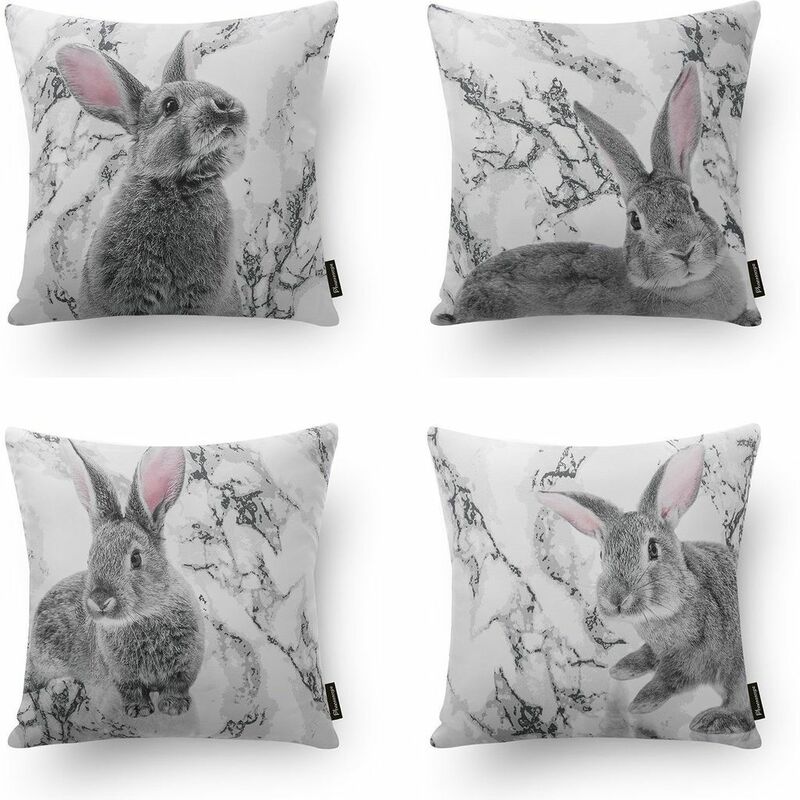 Each of the four pillow covers have a gray bunny with baby pink ears on a gray and white marble background. The bunny is incredibly cute and the pink makes this set a great choice for a blush color palette. We saved one of our favorites for last. These bunny pillows from SippingIcedTea are handmade upon order. 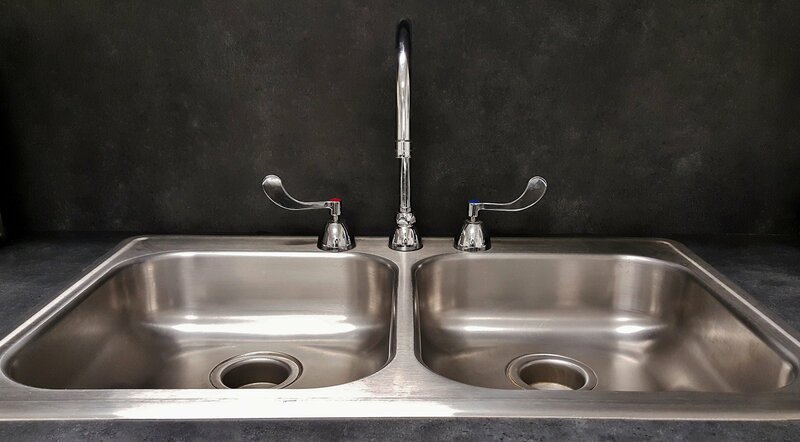 Yep, they’re hand-painted and brimming with character. Matter-of-fact, all of the pillows from this artist are; so, makes sure you check out the other products SippingIcedTea has listed. We’re sure this isn’t the only set you’ll fall in love with. Don’t forget to comment with your favorites! 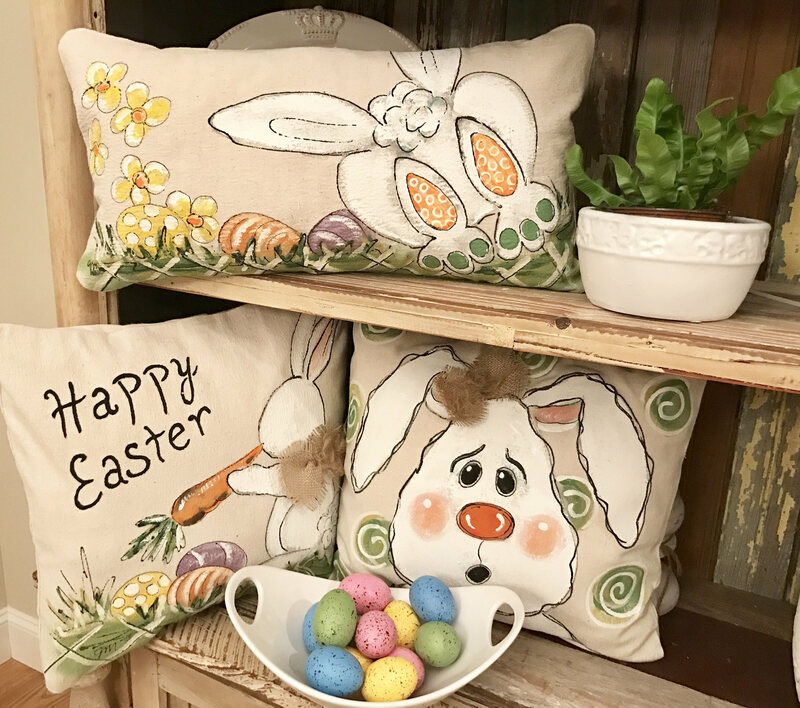 If we missed a spring or Easter pillow set that you think we’d love, we invite you to share it in the comments.